So fun! And so happy you can get it a Banana Republic. Awesome find! What a fun coat. I love that its available at Banana Republic. Love that polka dot print, it's not too bold but just right. I'd go with the Banana Republic. Perfect find! This is such a cute coat!! Love the shorter length of the BR trench! I'm MAD about this steal! Cool deal. I love the print! 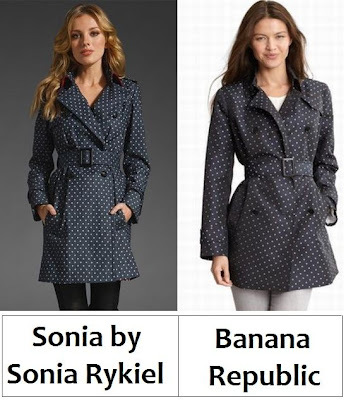 But I prefer the cleaner shape of the Sonia one. I'd do Banana Republic. I never bought anything from there, so this would be a great introductory piece to get. They are both really cute. I would happily take both! Looks like such a classy coat. I love the Sonia Rykiel one. love the polka dot trench! I love BananaRepublic. Their stuff is awesome and lasts forever. Dots are so cute! Preppy looks guaranteed too. Oh, polka dots trench! How I love it! I actually like BR one more.